Our journey, in the past year, has taken us around the world gathering friends from different cultures and we are back home for our Christmas holidays celebrating all that 2017 has had to offer and eagerly awaiting the New Year of 2018. 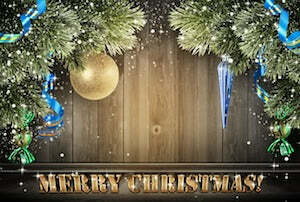 Christmas Day is a public holiday in many of the world's nations, and is celebrated religiously by a majority of Christians, as well as culturally by many non-Christians, and forms an integral part of the holiday season. The world is growing smaller every day with modern technology allowing us to travel farther, work all over the world and more importantly stay in touch every moment of our lives with our loved ones. Considering how far apart some of us live, holidays is when the whole family comes home to enjoy a sumptuous feast on Christmas Eve. Everybody loves the uncle from Italy, the cousin who lives in Japan, the aunt who works in India; and the merriment is multi-fold when they all visit us for the holidays. December is a holiday season wherein we celebrate not only Christmas but also other festivals/traditions like Hanukkah, St. Nicholas Day, Boxing day and Kwanzaa. Albeit different festivities the underlying truth is that of togetherness and family-bonding. Studies have found that during the holiday season - conflicts and negative emotions within family/friends are at its low, participation in rituals and family traditions is high, and it led to greater life satisfaction, lesser loneliness, and better work-life balance. So welcome your near and dear ones, as well as everyone from far-away lands, spread joy & cheer to one and all, and frolic in the magic of happiness that this season has to offer. 2018 is a new year for everyone around the world. Welcome it with a smiling face knowing that you are never alone. Cheers!!! Fun Fact 1: Canada Post recognizes the address “Santa Claus, North Pole, Canada - HOHOHO”. Any letters received bearing this address is opened and replied to. “Mediterranean Diet” is widely considered a naturally healthy way of life, and their cuisine carries with them a mix of flavors, which are usually difficult to resist. This is mainly due to the Mediterranean Olive Oil used to prepare their delicacies. 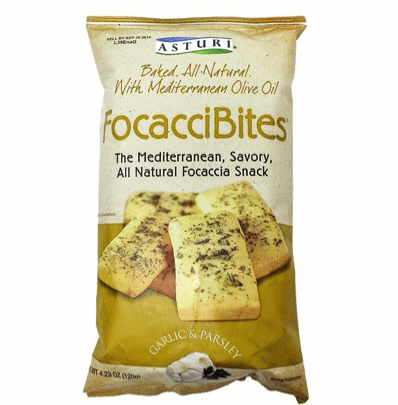 Foccacci Bites are deliciously crispy and delicate in texture and can be eaten alone or paired with your favorite hors-d’oeuvres, dips, or salsas. One of the most in-demand items from Vietnam is undoubtedly the Mung Bean (Green Bean) Cake. The most popular brand of cakes is sold by Bao Hien Rong Vang from the Hai Duong province, whose Mung Bean Cake is featured in this month’s box. This company established in 1922 holds the highest standard of quality in that they would destroy batches of cake if the quality standards were not met. It later became famous as “banh tien” (cake fit to offer to the king). This cake is best served along with a cup of tea (green, if you like it) and is found in most bakeries in Vietnam. This indulgently luxurious and rare seasonal limited edition Pocky can only be described as heaven on a stick! Winter Melty Pocky is much thicker than regular Pocky, and the rich chocolate coating is designed to instantly melt in the mouth into a creamy chocolatey goo. Each stick is also dusted in cocoa powder, to add to the rich chocolate experience. Elise is a wafer stick sandwich that comes in two different fillings - chocolate and white cream (and we’re giving you both) :). The white cream wafer comes with a rich vanilla flavored cream inside of crunchy wafer, and the chocolate cream wafer is filled with choco cream. Simple, sweet and light, this is the perfect snack to bring on-the-go when you get back to work after a long much-needed break. Haldirams is an 80-year-old institution which had its roots in Bikaner, Rajasthan (India). Now they are a major manufacturing company known all over the world for their traditional tastes. One of their famous snacks is the Gujarati Mix - aptly named so because it is built over the cuisine of Gujarat (a state in India). Gujarati cuisine is distinctively sweet, salty, and spicy simultaneously, and this is evident in this crunchy sweet and sour snack. It is a mix of puffed rice, dried noodles made of chickpea flour (besan or gram), toasted lentils and peanuts along with mixed spices which give it a distinguished taste. Sweet delicacies have always played a vital role in the culture and tradition of fine Italian cuisine. Italian desserts decorate tables at weddings, holiday parties, and other family gatherings. The La Florentine brand offers a variety of delicious confections including an extensive assortment of torrone nougat candies. This soft nougat is made with honey, sugar and egg whites with toasted almonds and/or pistachios all of which is enclosed in a delectably thin-wafer. Philippines: The Giant Lantern Festival in the Philippines is held each year on the Saturday before Christmas Eve in the city of San Fernando – the “Christmas Capital of the Philippines.” Originally, the lanterns were simple creations around half a meter in diameter, made from Japanese origami paper and lit by a candle. Today, the lanterns have grown to around six meters in size and are illuminated by electric bulbs that sparkle in a kaleidoscope of patterns. Colombia: Day of the Little Candles marks the start of the Christmas season across Colombia (especially Quimbaya). In honor of the Virgin Mary and the Immaculate Conception, people place candles and paper lanterns in their windows, balconies and front yards. Venezuela: People from Caracas, Venezuela roller-blade / skate themselves to the Church in the early mornings of Christmas day. Japan: Christmas remains largely a novelty in Japan, and a quirky “tradition” has emerged in recent years – a Christmas Day feast of the Colonel’s very own Kentucky Fried Chicken. White House: Lighting of National Hanukkah Menorah, White House - Washington, D.C., where each of the eight candles is lit in succession on each of the eight days of the Jewish festival of Hanukkah. Israel: In September or October, Jews believe that God opens the Book of Life for 10 days, starting with Rosh Hashanah (the Jewish New Year) and ending with Yom Kippur (the Day of Atonement). Thailand: In Thailand, a special three-day water festival on April 13–15 marks Songkran, the Buddhists' celebration of the new year. Parades feature huge statues of Buddha that spray water on passersby. India: Each of the religious sects in India has its own date for the beginning of the year. Traditionally, it falls around spring signifying the harvest season. China: The Chinese New Year (falls around February) is celebrated by people carrying lanterns and joining a huge parade led by a silk dragon, the Chinese symbol of strength. According to legend, the dragon hibernates most of the year, so people throw firecrackers to keep the dragon awake.